Our company is engaged in trading, exporting, and supplying Esbriet Tablets that is provided at affordable rates. 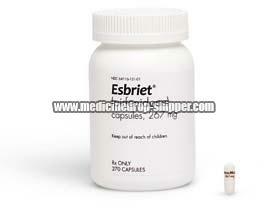 Esbriet Tablets are highly effective and authentic. The offered tablets are used for treating idiopathic pulmonary fibrosis while decreasing the symptoms associated with the lung, liver or the kidneys. Esbriet Pirfenidone Tablets are acquired from our reliable vendors. These medicines work by inhibiting the synthesis of TGF-beta.